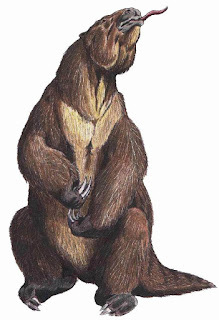 It's not every day that you can meet up with a Megatherium – one of South America's giant prehistoric ground sloths – on a street in England, or anywhere else, for that matter, unless that street just so happens to be Downing Street (no, not that one! ), in the English university city of Cambridge. For if it is, you can walk along it and gaze up at a Megatherium as often and for as long as you want to. And not just at a Megatherium either, as it will always be in the company of another palaeontological stalwart, the famous ornithischian dinosaur known as Iguanodon. Bemused? Allow me to explain. 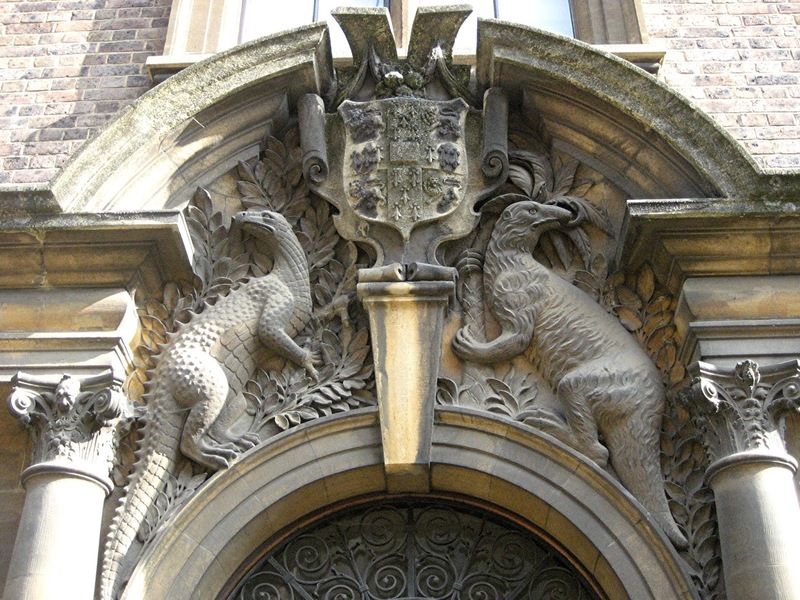 The Megatherium and Iguanodon in question are a pair of large, ornamental carvings flanking (or supporting, to use the correct heraldic term) the university's coat of arms present above the archway of one of the entrances to the Sedgwick Museum of Earth Sciences. 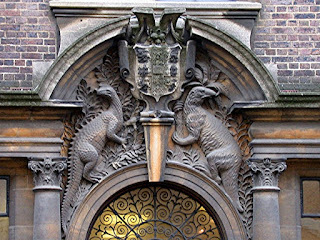 Also referred to as the Sedgwick Memorial Museum, it is based in Downing Street, Cambridge, and constitutes the oldest of this university's eight academic museums. 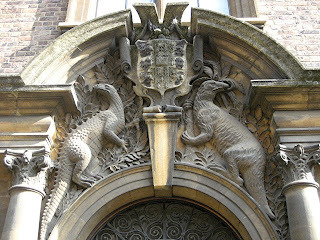 This museum is named in honour of one of England's most celebrated geologists, the Reverend Prof. Adam Sedgwick (1785-1873), who spent his academic life working at the University of Cambridge, and it was built to honour him and to contain his very sizeable collections of geological and palaeontological specimens, as well as those of English naturalist Dr John Woodward (1665-1728). Woodward was a fellow geologist who had bequeathed to the university half of his collection of over 9,000 specimens amassed by him over 35 years (the university subsequently purchased the other half), together with funds to establish the Woodwardian Professorship of Geology there (and to which Sedgwick was in due course appointed). These collections were all held at that time in what was then the university's Woodwardian Museum, established in 1728, but which would require a much greater capacity if it were to accommodate further additions. 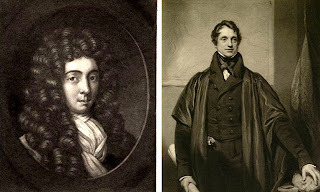 Hence the building of a bigger museum, honouring Sedgwick, was duly proposed. After several delays and false starts, the Sedgwick Museum's construction was finally approved on 16 February 1899, under Prof. Thomas Graham Jackson as architect, and was officially opened on 1 March 1904. Built at what was back then a notably expensive cost of £40,000, it now contains the collections of Woodward, Sedgwick, and countless other specimens too, currently totalling around 2 million rocks, minerals, and fossils. 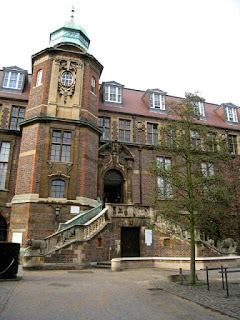 One of the Sedgwick Museum's most celebrated specimens on display is the very imposing replica cast of a complete skeleton of an Iguanodon bernissartensis, which was donated to the University of Cambridge by Brussels-based palaeontologist Louis Dollo during the late 1880s via King Leopold II of Belgium. At least 38 complete or near-complete Iguanodon skeletons had been recovered from a coal mine at the Belgian town of Bernissart in 1878. 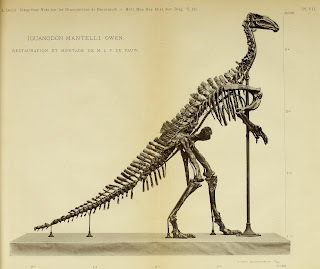 Nine of them were subsequently assembled as upright-standing mount specimens for display at the Royal Belgian Institute of Natural Sciences in Brussels (a total of 30 Iguanodon specimens can be seen in its Museum of Natural Sciences today), and it was from one of these that the cast prominently on display at the Sedgwick Museum was taken. 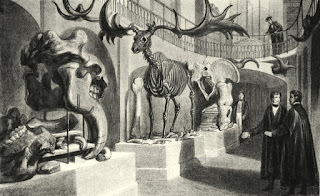 This famous exhibit in turn explains the choice of an Iguanodon as one of the two supporters carved above its Iguanodon/Megatherium archway. True, the skeleton cast's upright, rearing stance is now deemed to be incorrect (modern-day palaeontological belief holds that Iguanodon adopted a more horizontal stance), but back then this was how science assumed that this very sizeable dinosaur form stood in life, and explains why the archway's Iguanodon carving is also depicted in upright stance (note too the dragonesque series of dorsal triangular spines running down the carving's back – another now-rejected morphological feature). 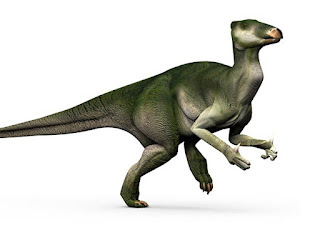 Moreover, being directly inspired by this cast, the museum's logo has always been an upright bipedal Iguanodon as well (it would be too costly and troublesome to change it now, especially as the logo is so well known). As for the Megatherium: the Sedgwick Museum's collection includes a partial Megatherium skeleton (and also a historic cast of it) that formed part of Sedgwick's original (1840) Woodwardian Museum collection. 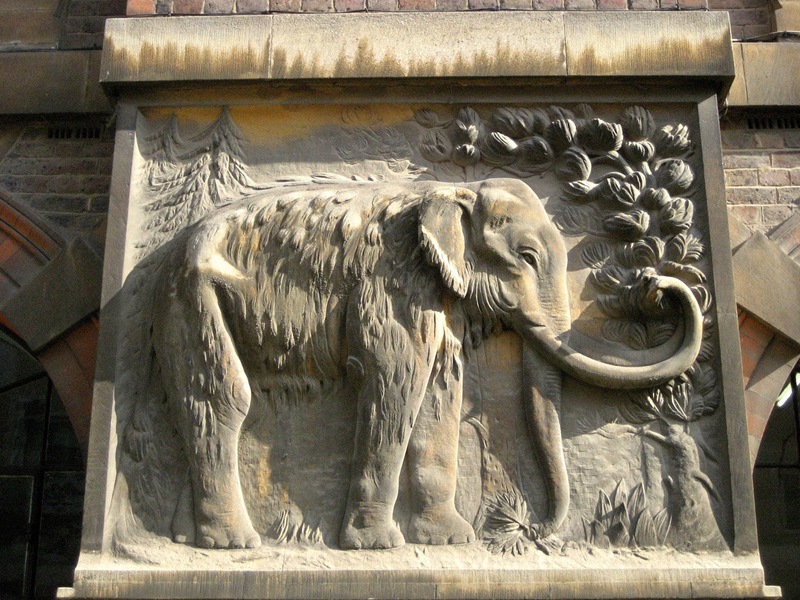 Moreover, the Sedgwick Museum is closely associated with Charles Darwin, as it houses a number of his scientifically-priceless specimens, and he famously discovered a Megatherium skeleton during his South American voyages, so the choice of this mega-mammal as the second supporter carved over the archway serves as a very apposite visual representation of this museum's Darwin links. In 2009, it curated a major public exhibition entitled Darwin the Geologist, to coincide with the Darwin bicentenary celebrations (Darwin was born in 1809). 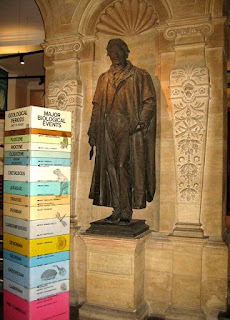 This exhibition focused upon his early geological research, and it displayed many of the specimens collected during his famous Beagle voyage. 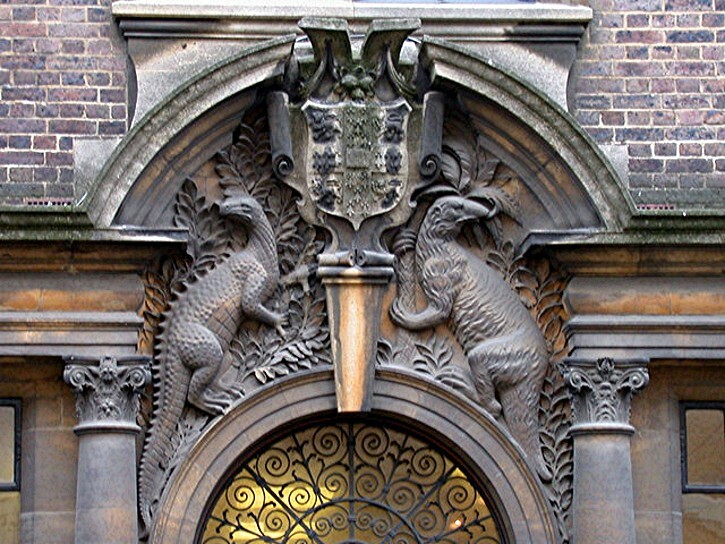 The Sedgwick Museum is open six days a week (closed on Sundays and some Bank Holidays), has free entry, and contains countless fascinating geological and palaeontological specimens on public display – click here to visit its official website for full details. 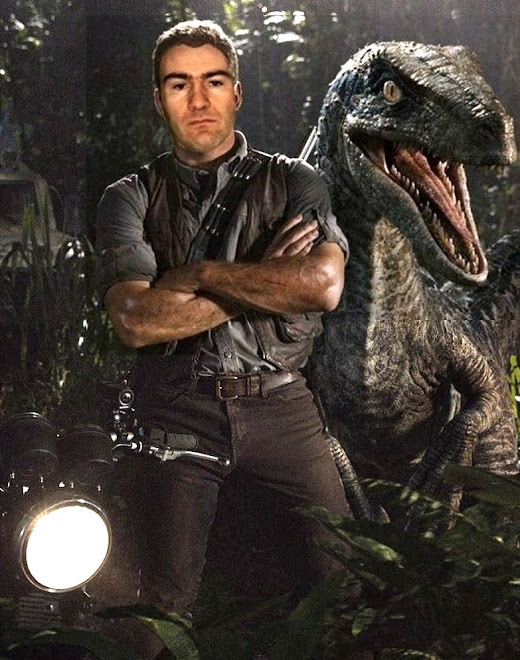 So why not wander down Downing Street, introduce yourself to the Iguanodon and meet up with the Megatherium as they stand tall in stately support, before entering the wonderful world of our planet's distant past as encapsulated within this celebrated museum's spectacular array of exhibits and displays? 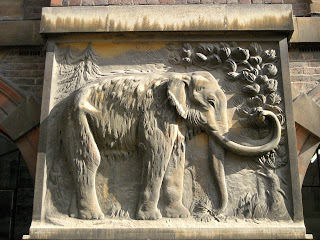 And if anyone can tell me the name of the sculptor who produced the Iguanodon and Megatherium carvings (and presumably the woolly mammoth relief too), I'd be extremely grateful, because I have so far been unable to discover this – many thanks indeed!